I sometimes get the question what the difference is between Usability and User Experience (UX). One may think that User Experience doesn’t necessarily imply that something is usable (whether it’s good or bad, it’s still an experience), and hence Usability is superior to User Experience. However, the emerging trend is to refer to User Experience as the wider perspective and Usability as being part of User Experience, as illustrated below. 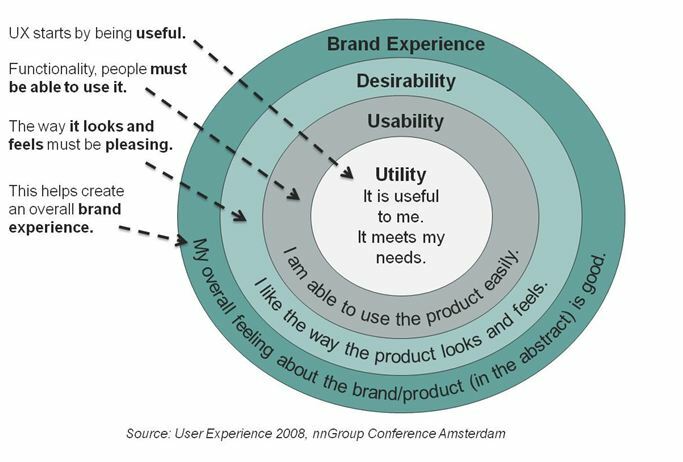 By this definition Usability is a subset of the overall User Experience. Usability answers the question, “Can the user accomplish their goal?” with effectiveness, efficiency, and satisfaction about the results (as per the ISO 9241-11 definition of usability). User Experience also answers the question, “Did the user have as delightful an experience as possible doing so?”. User Experience takes far more effort to do well, but the results have far better impact. A commonly used example of great User Experience is the Apple iPhone where Apple has spent efforts in all of the areas above and succeeded in doing so. The early iPhones did not include latest technologies (far from it) but was a success nevertheless due to being a great User Experience as per definition above. As the NeoSpot slogan states; IT’s all about the User Experience, not about the technology itself. The new version of ISO 13407, the International Standard for Human Centred Design (which will be called ISO 9241-210 to bring it into line with other usability standards), will also use the term “user experience” according to this link. Print article This entry was posted by Richard Nilsson on January 15, 2010 at 15:21, and is filed under All Articles. Follow any responses to this post through RSS 2.0. You can leave a response or trackback from your own site. Very nice article for those who still don’t get it!